The recent nuclear agreement reached between Iran and the P5+1 in Vienna, or the “Joint Comprehensive Plan of Action” (JCPOA), is an historic agreement which is consequential not only for international security and nuclear proliferation but for Iran and the broader Middle East as a whole. In particular, one of the key arenas that the agreement will impact is Iran-Arab world security relations and, at its center, the Iran-Saudi cold war. 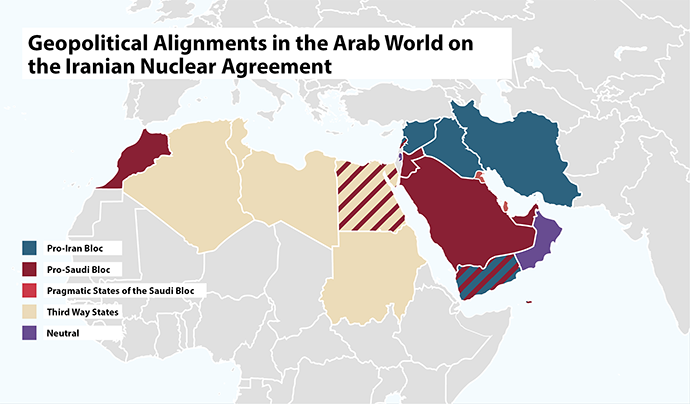 Spawning regional conflicts and proxy wars from Yemen to Lebanon, Syria, and Iraq, the confrontation between these two regional powers serves as the geopolitical and security background upon which the nuclear deal was forged. How this cold war proceeds—whether or not it is effectively managed and resolved, or how it escalates—will largely determine the security dynamics and landscape of the Middle East for years to come. Echoing these sentiments in a letter to the Lebanese daily, al-Safir, addressing the Arab world, Iranian Foreign Minister Javad Zarif warned of the shared security threats that confronted all Middle Eastern states alike: “it is incumbent upon us all to accept the reality that the age of scheming has long passed and that we are all together winners or we are all together losers. Thus lasting peace cannot be actualized with an assault on others’ security, and it is not possible for any peoples to actualize their interests without taking into consideration the interests of others.” In the same letter, Zarif proposed establishing regional talks for a peaceful resolution of violent conflict in the region. The Iranian Foreign Minister’s statements were all the more significant as they were orchestrated with his tour of Kuwait, Qatar, and Iraq following the conclusion of the comprehensive nuclear agreement, thus signaling Iran’s renewed focus on its immediate neighbors and its commitment to diplomacy. Given the significant ramifications that these openings may herald for the future of Iran-Arab world ties, it is more important than ever to engage and analyze viewpoints from scholars and analysts based in the region on the future of Iran’s role in the Middle East and Arab security. In this light, this publication brings together a diverse set of voices from Arab world experts to comment on the implications of the nuclear agreement between Iran and the P5+1 on Iran-Arab security relations. This chapter accordingly begins with a summary and brief analysis of Arab expert opinion in order to elucidate the broader trends and patterns of analytic thought on Iran and the Arab world. Thereafter, the chapter turns to an examination of the implications of the agreement on Iranian politics and the factors shaping the possibility of Iranian foreign policy moderation. It does so because no serious discussion on Iran-Arab security relations can ignore the Iranian decision-making process and domestic Iranian politics. Quoted in Thomas Friedman, “Obama Makes His Case on Iran Nuclear Deal,” The New York Times, July 14, 2015. Javad Zarif, Al-Safir, Aug. 3, 2015. For Academic Citation: Mohseni, Payam, ed. “Iran and the Arab World after the Nuclear Deal.” Edited by Mohseni, Payam. Belfer Center for Science and International Affairs, Harvard Kennedy School, August 13, 2015.